Allah, the PRAISEWORTHY, is praised in every time and under any circumstance; He is the PRAISEWORTHY as He is praised by His Exalted Self and by all His creatures eternally and permanently; to Him all perfection is attributed. The verb hamida means to glorify someone out of gratitude. Allah, Praise and Glory be to Him, says, “Those that turn to God in repentance; that serve Him, and praise Him.” (TAUBA, 112), and He says, “..soon will thy Lord raise thee to a Station of Praise and Glory!” (ISRAA’, 79). Allah, the PRAISEWORTHY, praises Himself in the Qur’anand says, “Praise be to God” (FATIHA, 2), “Say, Praise be to God, and Peace on His servants Whom He has chosen for His Message.”(NAML, 59). Allah, Glory be to Him, began creation with praise, “Praise be to God, Who created the heavens and the earth” (AN‘AM, 1), and He also ended it with praise, “..and the cry on all sides will be, Praise be to God, the Lord of the Worlds!” (ZUMAR, 75), where that is what the believers will say when they are resurrected, “It will be on a day when He will call you, and ye will answer His call with words of His praise.” (ISRAA’, 52). On perceiving the felicity of the hereafter, the believers say, “..Praise be to God, Who hath guided us to this felicity, nevercould we have found guidance, had it not been for the guidance of God.” (‘ARAF, 43). The previous words are said by the believers on seeing Paradise, and on entering they say, “Praise be to God Who has truly fulfilled His promise to us, and has given us this land inheritage, we can dwell in the Garden as we will.” (ZUMAR, 74); and when they are saved from hell, they say, “Praise be to God Who has removed from us all sorrow; for our Lord is indeed Oft-Forgiving; Ready to appreciate service.”(FATIR, 34). Praising Allah spreads between heaven and earth, it was said that praise is more exalted than the profession of monotheism because it comprises monotheism, praise and glorification. Actually, the mostexalted thing that can be uttered is the profession of Monotheism. To praise is to glorify someone for a volitional favour; but to commend is to praise someone absolutely for his favours. 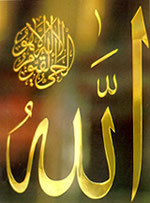 The real praise Allah is worthy of is only known and perfectly estimated by Him,the PRAISEWORTHY Who praised Himself. Prophet Muhammad, Allah’s Peace and Prayers be upon him said, ‘I cannot encompass all that I should praise You for, as You perfectly praisedYourself’ (HADITH). It was reported that whena man said, (Praise be to Allah as becomes the Glory of His Countenanceand the Greatness of His Throne! ), angels ascended and asked Allahhow can they register the man’s words, Allah said, “Write theman’s exact words till I retrieve him then he will be endowed with a completereward”. Glory be to Allah, the PRAISEWORTHY as He praised Himself since eternity, He is the PRAISEWORTHY eternally and permanently, He is Allah.